The prime minister of Bahamas has aired his concern about rising crime in the country. Prime minister, Perry Christie, said that the increasing incidences of crime could have a bearing on tourism in the nation, to the extent that there was no bigger threat to the future viability of tourism in the region than crime. He was addressing a group of delegates at the opening ceremony of the Caribbean Travel Marketplace, at the Atlantis on Paradise Island in The Bahamas. The prime minister observed that the escalation in criminal violence, robbery and theft within the respective jurisdictions of the region has become a grave concern for the authorities. He was also concerned about the ripple effect that crimes could have on tourism, which is a significant revenue earner for the state. The prime minister, who is also a former tourism minister, said that the problem did not only manifest itself in crimes against tourists. He said that stigmatisation of entire nations or tourism destinations as crime-ridden enclaves was destructive and self-defeating. The PM also called on concerned authorities to continue to aggressively market locations in the region as friendly places for vacation experiences. He assured that policing would be increased in order to ensure the safety of tourists. One of the United States’ top tourism cities, the last thing San Francisco needed was a crime wave to scare away its legion of international fans. Following a series of stabbings in the city’s traveller-heavy inner districts, authorities are planning to implement measures designed to keep the city safe at night. The measures will help San Francisco’s lucrative tourism sector and boost home values. It’s certainly an odd situation in a city regarded as one of the country’s most safe and universally tolerant. Crime in San Francisco has typically been significantly lower than in its surrounding city areas, and even lower than that observed in metropolitan areas in Los Angeles and San Diego. The city’s recent crime ‘wave’ is rather unusual, and it’s beginning to gain a place in the city’s psyche. The ‘crime wave’ – as local media are calling it – stems from a series of stabbings and vicious fights which occurred within the city centre. San Francisco’s large central city is generally safe throughout the night, with few tourists or locals affected and all-round crime figures low. A stabbing near Coit Tower – one of the city’s tourism hot spots – has set things off, with another attack following it. City government has already taken steps to address the problems, increasing police officer visibility during the night and encouraging tourists to take care when in unfamiliar areas. While the reported crime wave is taking up newspaper space, it’s something that isn’t that unusual. Given the history of unusual murder in San Francisco, the city may in fact be enjoying a period of relative safety. For tourists, it’s certainly off-putting. San Francisco remains one of the United States’ most dynamic and interesting tourism destinations, and it’s unlikely to disappear from the map due to a short series of crimes. However, it sits at a relatively difficult junction now – with local authorities wondering if its reputation for tolerance and peacefulness may take a public relations hit. Following a disastrous hostage crisis, Hong Kong has banned its citizens from travelling to the Philippines. The special territory, which is controlled by its own government, has set an alert to warn travellers of the potential dangers associated with travelling in the country. HK citizens in Manila have been advised to return home – advice that many have taken swift action on. Eight tourists from Hong Kong were killed during a bus hijacking in the city, after a disgruntled former police officer took control of a tour bus and executed its passengers. Manila’s police force was slow to act on the crisis, with a hostage team allowing the gunman to open fire on the Hong Kong tourists before moving in on the bus and freeing the remainder of its passengers. Hong Kong’s ‘code black’ travel warning has yet to be repeated in other countries, although several embassies have warned against travel within Manila. While the Philippines has a violent reputation, insurgencies and terrorist acts are rare in the capital. The vast majority of the nation’s violence can be traced to political and religious tensions in its southern regions. Residents of the Philippines have observed a day of mourning, with politicians throughout the city of Manila acknowledging that police action against the gunman was too slow. Survivors have since returned to Hong Kong, where they were privately escorted back to their homes following a special charter flight from Cathay Pacific. The country’s multi-billion dollar tourism industry is likely to suffer, as Mainland China warned its citizens not to travel to the Philippines. The nation’s leader – President Benigno Aquino – met with Chinese officials based in the country to discuss an investigation into the incident, which is likely to explain the inaction of police and counter-terrorism groups within the city. Lonely Planet’s new augmented reality travel guides are proving hit amongst Android users. Built to use the operating system’s advanced data mapping and navigation features, the applications lay out landmarks and other tourism-focused data across a complete three-dimensional view. With similar technology under the hood to that found on leading iPhone AR apps, the guides are top downloads. Users can purchase the applications from Google’s Android App Store – the operating system’s main extension and application interface. Priced at just $4.95 each and available for twenty-five different cities. Popular downloads include Sydney, New York City, and San Francisco – three tech-obsessed areas with a reputation for gadgetry. Lonely Planet plans to release maps for other cities shortly. 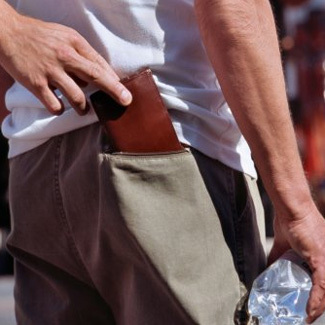 While the applications have been met with a warm reception from smartphone users, they’re being snapped up even more quickly by muggers and petty thieves. Augmented reality applications tend to leave users unaware of their surroundings and susceptible to simple theft attempts. Reports from smartphone owners reflect a very real trend of augmented reality resulting in snatched handsets. For those travelling in unsafe cities, the mapping software could end up becoming an unnecessary security risk. However, those in safer cities such as Tokyo and Bangkok are likely to benefit from the specialized instructions and information on offer, all without fear of their handset disappearing into a crowd. If you’re particularly worried, using a wristband can help eliminate grab-n-run theft. The applications could end up being the step Lonely Planet has needed for the past twenty-four months, as the company has watched digital competition rapidly catch up in usage and ownership rates. With competition in the form of recently acquired WikiTravel and region-specific internet publishers, it appears Lonely Planet has some way to go in winning back travel’s top spot. When Vince Hunter switched on his iPhone, the last thing he expected to see was his house being broken into. The Dallas resident was vacationing with family and friends in Connecticut, planning on enjoying the weekend and catching up with good company. Instead, he was forced to sit through a real time broadcast of his own home being burgled, damaged, and violated. The reason for Hunter’s surprising broadcast is a unique security system. By pairing a new iPhone application – iCam – with his home security system, Vince was able to record the thieves in action as they broke into his home. The footage has since been turned over to police, who plan to use it as evidence in the search for the not-quite-so-discreet criminals. Hunter is one of many Americans who opted to pair the application with their security system, and his plan is likely to be picked up by more as similar break-ins occur. With Facebook and Twitter so prominent in many of our lives, the importance of digital privacy is becoming more important than ever. Police believe many similar break-ins occur because of people posting holiday plans online. Thieves can view such information publicly, often plotting to break into residences while the owner is thousands of miles away. Although applications such as iCam go some way towards repairing the obvious threat, they’re rarely enough. Hunter’s security system was programmed to work alongside the device, automatically calling the police department upon detecting movement in the house. Enjoy your holiday time, but do so responsibly. Given the privacy concerns surrounding services like Facebook and Twitter, it’s essential that users think before posting information that could lead to a break-in or other crime. Online privacy experts have suggested that users keep their travel and leisure plans private, or only reveal them to a network of close friends.